There’s a wealth of adventure to be had in both Uganda and Rwanda, especially now that tourists are beginning to rediscover this region. We keep this trip small and intimate to create a deep connection with this captivating land. Of course, there’ll be trekking to spot chimps and gorillas, and wildlife drives through Queen Elizabeth II National Park to see elephants and hippos, but we’ll also visit the genocide museum for a closer look at the recent history of the region. Trust us: Uganda and Rwanda will stay in your memory for a very long time. Small group experience; Max 12, avg 8. Your flight must depart no earlier than: 20:00 on Day 8. Arriving early? Pre-book Nile River Whitewater Rafting in Jinja on Day 1, and be back in time for your evening welcome meeting. We strongly advise arriving one night earlier to facilitate the activity's early start. Meet your CEO and fellow group members and learn more about the upcoming itinerary. Fill out some paperwork and get ready for the adventure. Looking for a change from wildlife to simply something wild? Wake up early and head out on the Nile River for a full-day navigating the whitewater. Enjoy an exciting day testing your paddling skills in the rapids while waves crash over into your eight-person raft. This activity is suitable for rafters of all experience levels. Enjoy a BBQ and drinks with your group after conquering the rapids. 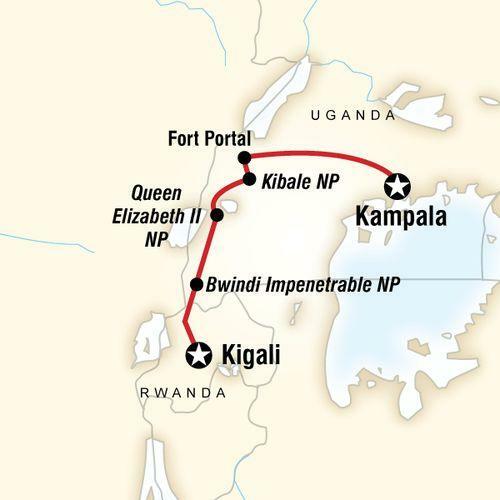 Trip includes approx 4 hours round-trip transportation to and from Jinja from the start hotel in Kampala. Explore the evergreen rainforest and trek to spot chimps in the morning or afternoon. Enjoy a traditional lunch in the Bigodi Community. Embark on a chimp trek with a park ranger/guide. See more than just chimpanzees in their natural environment. Learn about the ecosystem and keep an eye out for other animals. Although chimp sightings are not guaranteed, visitors stand a good chance of hearing and seeing our distant cousins as they are not bothered by humans watching their daily behaviour. Sit down to a traditional buffet-style lunch prepared with fresh, organic local ingredients. Guests dine in a grass thatched hut and learn about Bigodi dining etiquette. Your local hosts describes how the ingredients used in the dishes are grown, harvested and prepared. Take a guided walk through the Bigodi wetlands. On your tour, you will likely see several kinds of monkeys including black and white colobus, red colobus, mangabey, red tail, vervet, and L’Hoest. Other wetlands mammals include baboons, sitatunga (an increasingly endangered swamp antelope), bush pigs, civet cats, mongooses, bush bucks and an occasional chimpanzee. The area also boasts an incredible bird population. Continue on to Queen Elizabeth NP, stopping at the equator. Head out on a wildlife safari drive in the afternoon. Keep your eyes peeled for warthogs, elephants, buffalo, five different species of primates, and hippos. Enjoy a wildlife safari drive inside Queen Elizabeth National Park. The park is home to Uganda's largest wildlife populations. Keep an eye out for buffalo, elephants, hippos, hyenas, lions, warthogs, and the elusive leopards. Take an early morning wildlife safari drive and enjoy lunch inside the park. Opt for an evening cruise along the Kazinga Channel. Don't waste a minute - start exploring. Take a boat cruise on the Kazinga Channel, a waterway inside Queen Elizabeth National Park that connects Lake George and Lake Edward. Look out for a variety of wildlife who are drawn to the channel shores. Spot birds, crocodiles, hippos, and reptiles. Rise early for the tour's main highlight - gorilla trekking! Head into Bwindi Impenetrable National Park to meet the park ranger/guide for orientation. Embark on the trek, which can vary in length and difficulty, depending on the location of the gorilla family that's being visited. Spend 1 hr (max) observing these beautiful and endangered creatures, a truly privileged experience. Trek back and return to town. Enjoy free time in the afternoon. Take an unforgettable guided trek (1-6 hrs) deep into volcano forests of Bwindi Impenetrable National Park for a wildlife encounter of a lifetime, and meet a family of mountain gorillas. One of Africa's major highlights, a close encounter with these amazing animals is simply breathtaking. Get prepared before heading out: bring plenty of water and waterproof clothing (it can rain on only a few minutes’ notice), and be sure to bring protective bags for cameras and film. Dress in layers with long sleeves and long pants to protect against stinging nettles found in the forests. The trek’s often chilly, at first, until you start trekking. Note: Ugandan authorities are fiercely protective of this natural treasure, and currently permit only a maximum of eight people, per day, to visit a given gorilla family. The group will be split into different sub-groups for the trek, and depending on the number of travellers, different sub-groups may do their trek on different days. Depending on when you get back from your gorilla trek, you may have some time to explore more of the area. Hire a local porter to carry your day pack throughout the trek, giving you more ease on your journey. Cross the border into Rwanda, then head to the capital city, Kigali. Visit the genocide museum to learn more about the dark history of this fascinating country. Tour ends on arrival at hotel. Ready for a little more ink in your passport? Grab your bags and get ready to check another country off your bucket list. Visit the Kigali Genocide Memorial Centre, which serves as a permanent memorial to those who fell victim to the genocide in 1994. The centre opened on the tenth anniversary of the Rwandan Genocide, in April 2004, and was built on a site where more than 250,000 people are buried. 7 breakfasts, 3 lunches, 4 dinners. Allow USD165-215 for meals not included. Looking for a change from wildlife to simply something wild? Wake up early and head out on the Nile River for a full-day navigating the whitewater. Enjoy an exciting day testing your paddling skills in the rapids while waves crash over into your eight-person raft. This activity is suitable for rafters of all experience levels. Enjoy an included meal and drinks with your group after conquering the rapids. Guest farm stay near Kibale NP. Chimpanzee trek. Bigodi Community lunch. Queen Elizabeth NP wildlife safari drives. Guided gorilla trekking in Bwindi Impenetrable NP. Visit to Kigali Genocide Museum. All National Park fees and trekking permits. All transport between destinations and to/from included activities. Admire a family of mountain gorillas in their natural habitat, trek to see chimpanzees in Uganda, keep your eyes peeled for the plentiful elephant and hippo populations in Queen Elizabeth National Park. Please note that all passengers must be aged 15 years or older (prior to start of travel) to go on this tour - there are no exceptions to this as it is for safety reasons and strictly controlled by the Government. This trip is rated a level 4 physical requirement - travellers should be in excellent physical condition, without any heart problems and prepared to spend strenuous days in humid rain forests, steep terrain and high altitude trekking for chimpanzee and gorillas, as well as other primates. Please ensure you meet the requirements as described under "physical rating". Much of the accommodation on this tour is in simple furnished tents with shared bathroom facilities. Please remember that this is a developing area and as such, accommodations/service may not be of similar standard to which you are used to in your home country. As well, interruptions in electricity and water can be common. We appreciate your patience and understanding, as well as your sense of adventure. There are a couple of ways to get to Kampala from the airport. Public transport is available at the airport to the town of Entebbe, where you can transfer to a vehicle that goes to Kampala. This would take about 1 hour in total, and costs a total of US$2, better payed in local currency. We recommend an airport taxi, which takes about 40 minutes and costs US$25. Look out for yellow-band cars, and each vehicle has an identification number and inscription "AIRPORT TAXI" in black letters. These are available on the ground level in the arrivals area. If you would like more time in Kampala you can choose to pre-reserve a room at our joining hotel in Kampala through G Adventures. PLEASE NOTE you must be at the joining hotel in Kampala at 8.00AM on Day 1 for a meeting with your CEO and fellow travellers before the 2.5 hour drive to Jinja. Your clothes will in all likelihood get very muddy and may not recover to their original state - therefore take old clothing for trekking. Hard wearing clothes, no bright colours, or no army camouflage clothing should be worn. Greens, khaki and similar neutral clothes are recommended. ** Please be advised that a valid yellow fever vaccination card is mandatory for entry into Rwanda. ** Please be advised that a valid yellow fever vaccination card is mandatory for entry into Uganda. There are several foreign exchange bureaus in Kigali offering similar rates, the most widely accepted currency is US$. Your CEO will inform you where you can change money throughout the tour and approximately how much money you will need for each country. That said - most everything is included in this tour - we recommend that you bring enough USD cash with you, to cover for any additional drinks/snacks and souvenir shopping. Travellers on 2018 departures are eligible to pre-book Nile River Whitewater Rafting in Jinja on Day 1 with round-trip transportation from Kampala, and be back in time for your evening welcome meeting. We strongly advise arriving one night earlier to facilitate the activity's early start. Please note that if you choose to participate in this excursion, the pick-up will depart from The Forest Cottages in Kampala at approx 7:30am. If you have booked alternative pre-tour accommodations, please be sure to contact Nile River Explorers the day before to arrange a convenient pick-up point, or be at The Forest Cottages by 7:00am. You can store your luggage at The Forest Cottages for the day, if you still have to check in.